The Saracens Sport Foundation are extremely proud of our ever-growing disABILITY sport programmes that support a wide range of individuals and needs. Our disABILITY programmes offer opportunities for individuals of all ages with a wide range of disabilities. Our key aim is to support their social and physical development using sport as a catalyst for change. Check out all our disABILITY programmes below, and if you have any questions, wish to sign up to one of the disABILITY programmes or to volunteer please get in touch using the contact form at the bottom of the page. 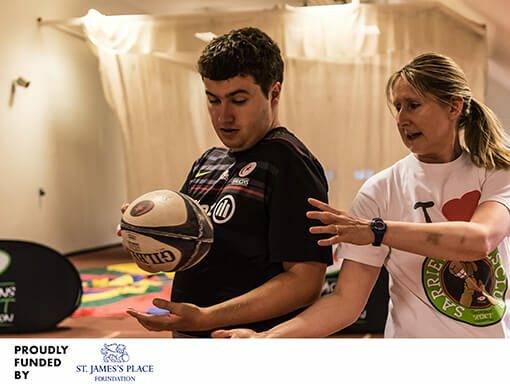 Sarrie At Home is the Saracens Sport Foundation’s very own disABILITY school sport provision aimed at SEN school classes and groups across North London and Hertfordshire. Located at Allianz park on our own 80m indoor track, we are also very lucky to have our own on-site sensory room, providing a respite area for participants throughout the session. Sarrie At Home sessions promote fun and active learning through various multi-skill activities that have been specially designed to enhance the physical and mental ability of the participants whilst also providing a fun and sociable environment. Specialist equipment is utilised to engage participants of all abilities. Sessions are delivered by our highly enthusiastic and motivated coaches to provide the best development and learning opportunities possible. Sarrie’s Skills Club is an award winning, out of school sports provision for young people with severe autism aged 14 to 24. The programme is a pioneer for severe autism as it is the first provision specifically for individuals with severe autism to be run by a professional sports teams in the UK. The aim of these sessions is to improve the physical capability of each individual as well as using it as a vehicle to improve basic life skills. In order to achieve these goals, each member has at least one-on-one support from highly qualified staff and volunteers dedicated to help each individual. During the session, we provide a respite area to parents and carers in one of hospitality suites, where they are able to have some time to themselves for a couple of hours. Proudly funded by St James’s Place Wealth Management. Strictly Sarrie is our disABILITY dance provision for individuals aged 14 to 24 with high functioning disabilities. It offers an opportunity for young people with a disability to be part of a dance club as well as importantly increasing their health and fitness levels. 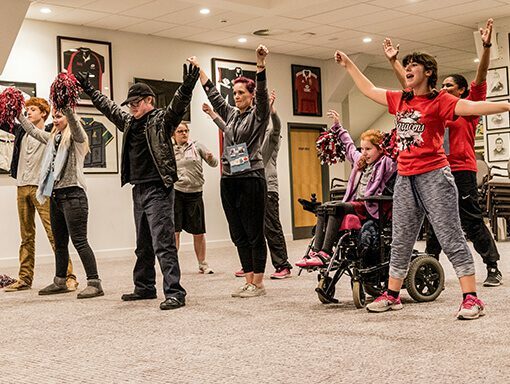 The sessions are led by Saracens dance coaches and supported by a base of volunteers, but with input from the group participants who are encouraged to take ownership of the sessions, choosing the dance styles, music and choreography to focus on. Dance routines range from street dance and cheerleading through to freestyle dance. At the end of the session the group always have a chance to talk about the highlight of the week and cement friendships made. The session ends when stickers or certificates are awarded in front of parents. For the Dance @ London Stadium 2019 Strictly Sarrie performance, please see our videos of the routine to practice from. 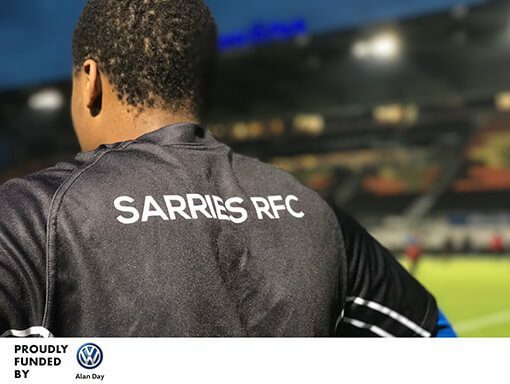 Sarrie’s RFC is our disABILITY rugby club for young people aged 14 to 24 with high functioning disabilities who train on our very own 4G pitch using rugby as a tool for change. Sarrie’s RFC provides a regular opportunity for physical exercise whilst also putting an emphasis on developing the member’s social skills and behaviour. Our sessions are designed to have the perfect balance between repetition and progression so that our members do not get overwhelmed but continue to develop. Sarrie’s RFC also provides a parent respite area during the session. This allows the parents of our members to relax in one of our hospitality suites whilst being confident that their child is safe and is engaging in high quality physical activity. Proudly funded by Alan Day VW. Sarrie’s Swing is an outreach golf programme delivered in SEN secondary schools to individuals with high functioning disabilities. The programme uses specially adapted golf equipment to introduce the game of golf in the easiest way possible. 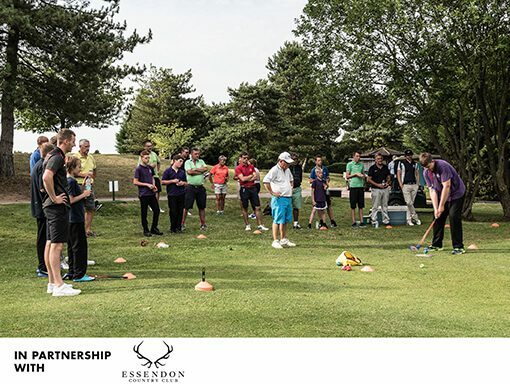 The participants will also learn the social norms and key values of golf throughout the programme before attending a specially designed charity golf day at Essendon Country Club. This golf day celebrates the participant’s completion of the programme and their graduation into a disABILITY golf academy. The disABILITY golf academy will involve weekly sessions based at Essendon Country Club where the participants will develop a further understanding of the game. All of these sessions are delivered to the highest quality and are facilitated by qualified PGA coaches that hold certificates in disABILITY coaching. Proudly funded by Essendon CC. 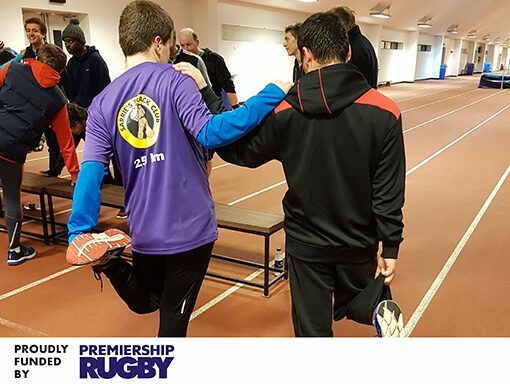 Supported by Premiership Rugby, Sarrie’s Track Club is our disABILITY running club for those aged 16+. Participants undertake a registration and welcoming process before running laps of our track! Each week, the participant’s laps are recorded as they progress through recognised distances including 10km, 100km & 250km. Each participant is allocated a ‘buddy runner’ who runs alongside them to help support and motivate them during their laps! It is also the ‘buddy runners’ job to ensure that the participants are challenged at their own level to ensure maximum enjoyment from the sessions. The programme is designed to be fully inclusive with health, fitness and social benefits for the ‘buddy runners’ as well as the participants. Proudly funded by Premiership Rugby. 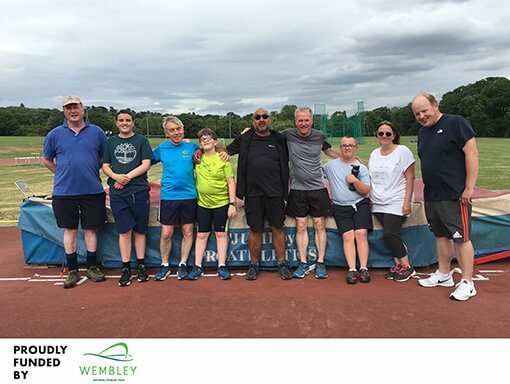 Sarrie’s Track Club Harrow holds weekly disABILITY running sessions where participants aged 16+ undertake a registration and welcoming process before running laps of the track! Each week, the participant’s laps are recorded as they progress through recognised distances including 10km, 100km & 250km. Saracens Sport Foundation employ a qualified running coach to deliver these sessions each week with the support of various volunteers. The coach delivers specific running activities to get the best out of each individual both physically and socially. Whilst our athletes are completing their laps, parents or carers are catered for with drinks and snacks in our on-site respite area. Proudly funded by Wembley National Stadium Trust. 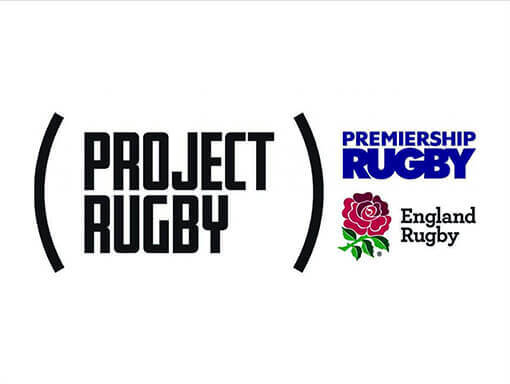 Proudly funded by Premiership Rugby and England Rugby.